"Members Independent Winegrowers since 1988, Hervé and Marie-Claire FELIX, winegrowers in Saint-Bris-le-Vineux, are present on the internet sales site, open by the union for a fortnight. 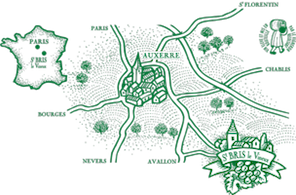 A Irancy, A Côtes d’Auxerre Rouge, A Saint-Bris, all of them become vintage 2012 and A Côtes d’Auxerre Blanc 2011 : at Saint-Bris-Le-Vineux, Domaine FELIX chose to focus on online sales in joining to the site, recently launched by the Independent Winegrowers. Too early to know if the adventure e-commerce will be profit. For this moment, we do not have any order, but it is a little bit new. Our kid pushed us to join them, acknowledges Hervé Felix. We selected four of our wines. Four products that we don't have in stock anymore. A land of 32 hectares. At the head of 32 hectares, essentially on the vineyard area of Saint-Bris, although historically the Felix family soak its roots in the soil of Irancy, Hervé and his wife Marie-Claire did develop the work of Jean, Robert's father, uncle. In 1988, Félix chose to join the Independent Winegrowers. Wishing to improve the marketing of their wines, they participate each year in a dozen exhibitions, organized by the union. By attempting e-commerce today, Felix hopes to diversify its customer. Maybe touch 30-40 years old. 'Conditions are very interesting. Above the 300€ it is carriage paid. With the possibility to mix the order. For us, this is as a cost. But once the pallets shipped, we do care about anything. A company is responsible for storing products in Macon (Saône-et-Loire) and deliver them.' "